Thank you to everyone: who helped make this a great success, for your continued support of the workers and good jobs in Alaska, and the worker-called boycotts at the Sheraton Anchorage & Anchorage Hilton hotels. Support the boycotts by not eating, sleeping, or attending meetings at these hotels until workers can resolve a fair contract with their Kentucky-based (Hilton) and Texas-based (Sheraton) employers. AFL-CIO President Trumka speaks to the crowd about how employers like the Texas-owned Sheraton Anchorage & Kentucky-owned Anchorage Hilton, are a cancer. Texas-owned & managed Sheraton is not above the law! Settle Unfair Labor Practices Now! Maria Hernandez and a group of housekeepers from the Sheraton Anchorage present a petition to the director of sales at the Sheraton Anchorage. The housekeepers of the Sheraton Anchorage have been forced to do exhausting workloads for 2 years. The hotel continues to attempt to increase workloads to unfair levels. Unite Here Local 878 led the first Union contingent to march in the Anchorage Pridefest, in Alaska. About 25 people joined Local 878’s contingent, chanting “Same Struggle, Same Fight!” and “Equal Rights is a Human Right!”. A big Thank You to those who came to march with us in the Pridefest’s “Be Seen, Be Heard, Be Pride” parade: AK AFL-CIO, SAG-AFTRA, Plumbers/Pipefitters 367 & Local 878 members. Alaska Central Labor Council sponsored this year’s Pridefest as well. Thank you also to Patti Higgins & Jodie Dominguez for showing support for Labor within their contingents. https://www.unitehere878.org/wp-content/uploads/prideu.jpg 389 587 Local878 /wp-content/uploads/local878logo-300x203.jpg Local8782012-06-09 00:01:372015-03-07 02:20:02"Equal Rights is a Human Right"
Check out this video from Unite HERE Local 878! Workers at the Sheraton Alaska who experienced harassment, intimidation, cut hours, unspecified job titles, loss of seniority and much more with new management in place. The ongoing labor dispute at the Texas-owned & managed Anchorage Sheraton rages on. Numerous members of the Alaska community gathered on May 18th to picket the Anchorage Sheraton’s unfair & unlawful violative practices. Stop hurting our community & respect Alaska working standards! Faye G with her oldest daughter at the market in Kenai!! Maria Hernandez with her whole family, out at Jalapeños restaurant in Eagle River on Mother's Day. Two generations of Hernandez! Pat G with her family: Stacy (daughter in law), Kristina (daughter) & Donna (daughter) get together around Mother's Day. We wouldn’t be here if weren’t for our Mothers. A few of our Union Moms shared their day with us. Thank you for all the hard work you do on so many fronts. https://www.unitehere878.org/wp-content/uploads/mothers_day_03-1.jpg 500 500 Local878 /wp-content/uploads/local878logo-300x203.jpg Local8782012-05-13 23:15:362015-03-07 02:20:49Happy Mother's Day!! 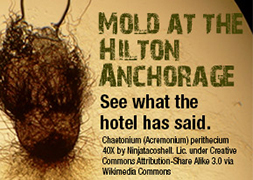 For over three years Alaskan workers at the Hilton Anchorage have been fighting for affordable healthcare, safe workloads, job security protections, and reasonable wage increases in the face of out-of-state corporate employers, Columbia Sussex. Dozens of Community members came out, in spite of the not quite Spring temps, to Picket the Anchorage Hilton on May 3rd & show their support for Good Jobs in Alaska!